I know it's a day late... but I didn't get home until the early hours of this morning from my trip. This is Glitter Gal High Voltage. 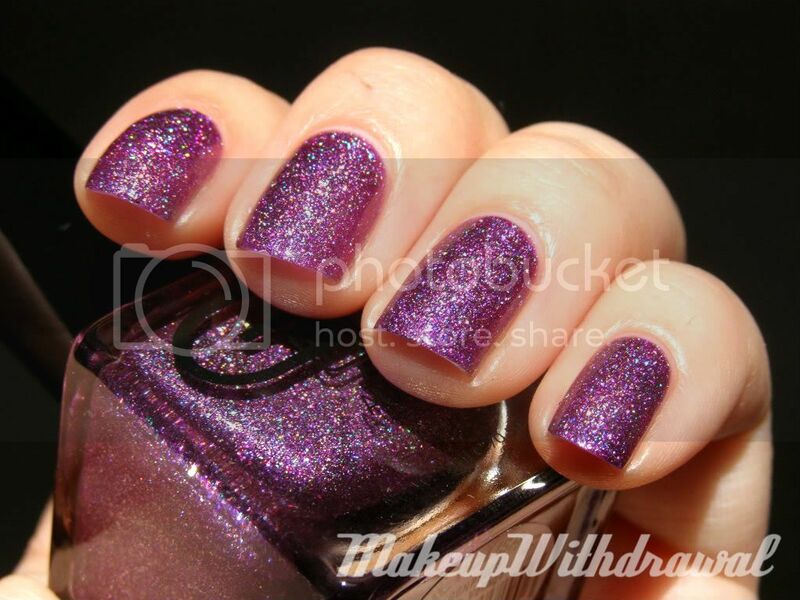 It's from the Sparkle range, meaning that it has larger, chunkier holo bits. Here, I've worn with three coats. I like how glossy my Glitter Gal polishes have been drying, at least all the ones I've tried so far. I hate putting on a top coat that dampens the holo effect. I've also had really good luck with how long they've lasted. I usually change my polish every day, but this one was so pretty that I kept it on for three days, no chips. Yes! Three days without topcoat! You could most definitely get even longer wear time if you don't work with your hands like I do. In other news, I can't wait to use Morgan's camera that I uhm, "borrowed" from him. He's not happy about it, but I pointed out that until the weather warms up, he's not going camping or hiking anytime soon so it would be just sitting there, untouched. So I'm using it until May, when hopefully I'll buy myself a camera for my birthday. Product featured was a prize given to me for free for winning a contest. For additional information, please refer to my Disclosure Policy.